Twenty million people living in Egypt’s capital city - whose Arabic name is translated as ‘victorious’ at times and ‘vanquishing’ at others - push tiredly and grudgingly every day through a struggle to carry out the routine of their daily lives. But Hossam Atef, 20, a freelance photographer living in Cairo, decided to make the sad indifference stand out. 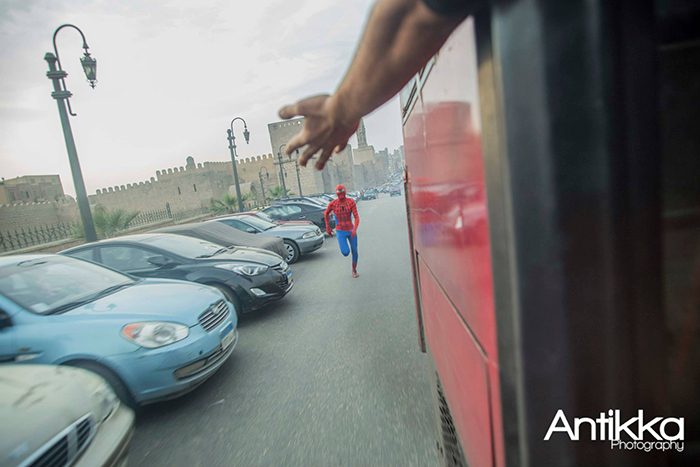 “We thought if Spiderman spent a normal day of an Egyptian’s life, what would happen?” Atef told Ahram Online. 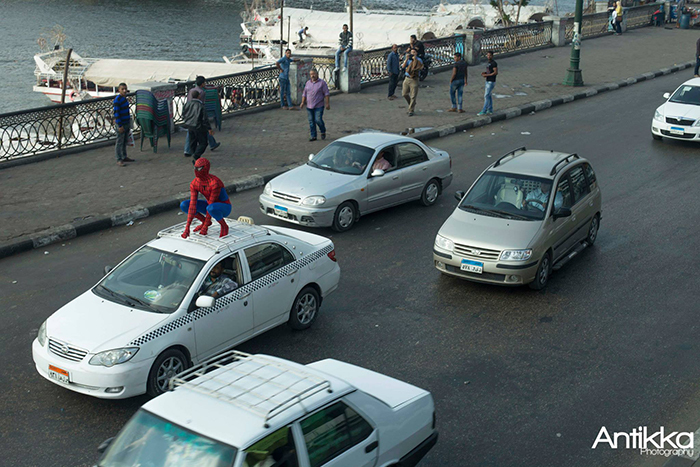 For four days Spiderman has been shot on Cairo’s streets going about normal daily activities, with his photos going viral on social media. "In fact, all Egyptians are superheroes for enduring these difficulties every day," Atef added. Running on the street to catch the overcrowded bus (that usually does not wait and maybe another one will not come), trying to break up a street fight, squeezing into a metro carriage, sleeping on the street, working on a toktok for extra cash - the dust, the noise, the chaos. Cairo was ranked 122 out of 140 cities around the world in the 2013 Global Livability Ranking conducted by the Economist Intelligence Unit (EIU). The city ranks among the top around the world in population density and noise levels. 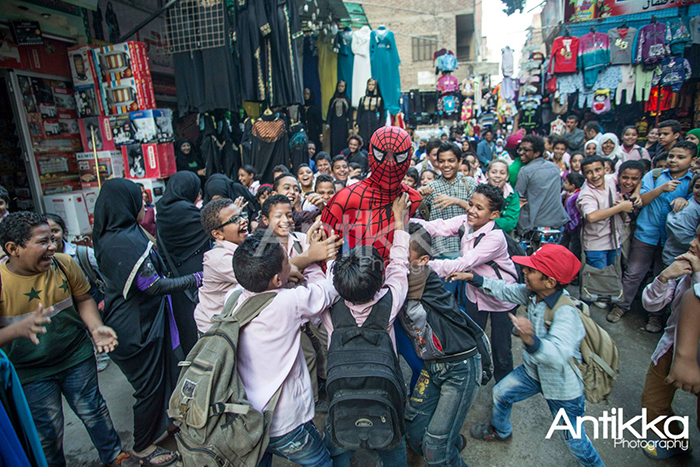 Spiderman has been to several working-class districts around Cairo including Boulaq El-Dakrour, Sayeda Zeinab and Talbeya. As many Cairene neighbourhoods remain downrun with hardly any public space to accommodate children's activities, youngsters are Spiderman’s most excited audience. In one instance tens of school children surrounded him and clung to him until he had to run away. Atef and Saad sought a traditional cafe in the neighbourhood where the owner seemed to give a special welcome. “Seeing how the children loved us, he thought we were ‘[President] Sisi’s men’ and decided to offer us free drinks,” he said. However, even popular superheroes do not escape police scrutiny in Cairo. Atef recounted that to take a photo on the metro Spiderman had to use camouflage – he wore a galabeya [traditional men's dress] over his outfit while the photographer rolled a sweatshirt over his camera. 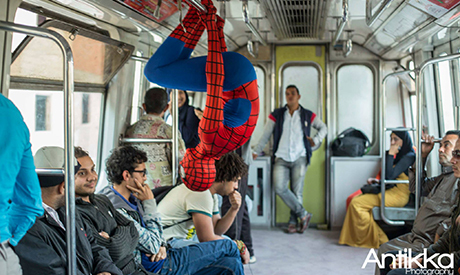 Once inside the carriage and the metro took off, Spiderman revealed himself and Atef took his shot. "We do not have a license [to shoot in these public places] and no one would understand what we are trying to do," he said. Another time in downtown the duo were stopped and questioned by police. They took their national identity cards and checked their records before they let them go. Meanwhile, the Spiderman team said they would continue to take photos around Cairo and still have many ideas to shoot, perhaps with a special surprise later. “Wait for us in January!” Saad said. Hey, I think I understand what you're trying to do and show. It's really great. 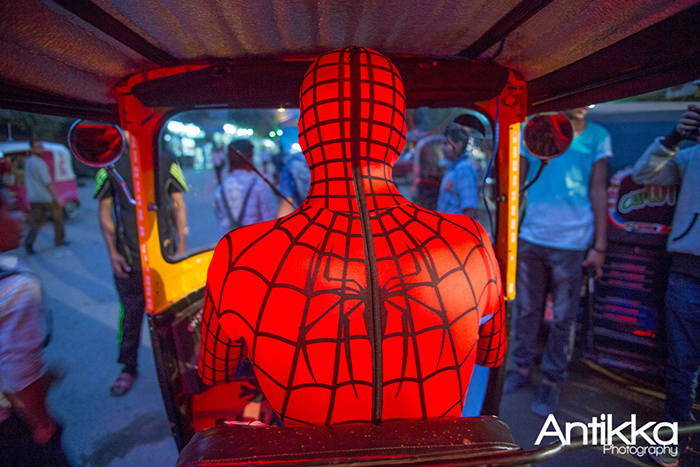 Laughed a lot because the Spiderman in Cairo is so grotesque. Thanks for taking the risk of taking such photos. Please don't stop! Very good way to divert the attention of people and entertain children and others away from the terror of MB, and busy life earning a living. This is so dumb. "Social Experiment" my A$$. Why are Egyptians amazed at some guy in a leotard? Don't they know he's not real, he's a figment of a main stream media creating characters to market to you. Grow up, Egyptians.